I love the Harry Potter books and films. I’m pretty much smitten with the characters, the detailed map of a magical world both behind and within our own muggle realm, the ways that the mundane struggles of kids in a boarding school become enmeshed with the cosmic struggles of good versus evil…all of it. Man, oh man, do I love Harry Potter. Beyond my fascination with the story (I’m a super geek, as demonstrated by my passion for science fiction and high fantasy narratives), I’ve also learned something intriguing about myself while following Harry and his comrades through those ever-shifting halls: I most strongly identify with Minerva McGonagall, the no-nonsense yet compassionate professor of transfiguration at Hogwarts. At first this realization was rather alarming. If I identify with one of the profs, does that mean I’m getting old? Why McGonagall? Why not that lovely Luna Lovegood? Why not smart and perpetually-prepared Hermione Granger? There was certainly a time in my life when I might have identified with either of them – and not one of the teachers. I suppose that on the surface the answer is pretty obvious. I am getting older and now I’m a teacher of sorts – a figure within the institution whose job is to teach, care for and walk alongside teenagers. Of course I identify with one of the professors! But why McGonagall? Is it because she’s one of the few women on staff? Perhaps. But after watching the last of the films (HP 7.2) a couple times and experiencing her all-consuming desire to protect those kids with such intense, gut-wrenching determination that during both showings I found myself shaking, teary-eyed in the theater seat – well, after that I’ve begun to think that there might be a bit more to this than my age, profession or gender. I am, admittedly, a little bit on the silly side more often than not. But I don’t think that’s what’s going on either. Instead, I believe something in Rowling’s storytelling has struck a chord deep inside me, rattling loose an instinct that I never really knew I had, or at least never recognized as such: the desire to protect. When I read the Harry Potter books (or watch the films), especially from Order of the Phoenix onward, and I see the way the world is crumbling into chaos around those kids, every fiber of my being screams “They’re only children! Why does it have to be them who must save the world??”. I reckon Minerva McGonagall wonders the same thing. So there it is. I want to protect “my” kids. I want to keep them from harm and put a wicked boot in anyone and anything that threatens their well-being. It’s a normal, perhaps maternal/parental instinct – and yet it is also deeply unsettling. Why? Because now that I know it is there, I have to tend it. A drive to protect can become an act of violence against the very person or thing you are protecting. Hemming someone in, eating away at her freedom of movement or voice or action, perpetually doing for the other instead of letting him do for himself – all of these things ultimately harm more than they help. And yet they are so tempting when you love someone and yearn for their safety. This is why I both identify with and feel drawn to the character of Professor McGonagall: in spite of her consuming desire to protect the students at Hogwarts, she only does what she is especially able to do and then she gets out of their way. She knows her students. She knows their gifts. And even though it pains her to see them in harm’s way, she recognizes that they are a part of things and must be allowed to help. So she does her bit and helps those students to discern and play out their parts. She’d die for them if it came to that, but she won’t force them to die the slow death that comes from squelched talents, hopes and dreams all in the name of safety. I want to protect “my” kids, but not at the expense of their potential. It’s terribly risky business, but that’s who I want to be – which is why I’m a Minerva McGonagall. 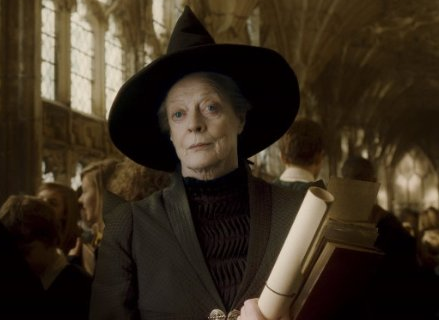 I love Mcgonagall, and you pointed out some things i’ve never noticed about her. Nice post!